In the United States, the Republican Party is the conservative party and the Democratic Party is the liberal party. 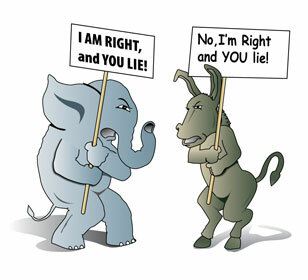 In turn, each party stands for opposing views on nearly every major issue that comes up. This makes knowing what each party stands for easy. It makes it easy for voters to align with one party or the other. However it makes the ability to move America forward for the benefit for everyone next to impossible. With each party working to further the views of extreme liberals or extreme conservatives, the vast majority of citizens who find themselves closer to the middle are left with nothing. Each party is trying to move policy in one of two very opposite directions. This is clear as during Obama’s first term in office, we see very little bipartisan support from Republicans. Going into November 2012, we are going to choose between giving Obama four more years to undo the damage done by Bush and the Republicans or giving Romney a chance to reestablish the Republican Party and show that what happened during the Bush era was the result of Bush and his administration, not the whole Republican Party. However, with the current landscape of American politics with two polarized parties, it is certain that no matter who wins in November, the battle in Congress will continue between the two parties who probably could not even find a compromise on what to eat for lunch.